Aqule houseware will help you to achieve a success in your choice; don’t miss this good opportunity. It’s a responsive Prestashop theme from Plazathemes. Its design is perfect for kitchen store, houseware store, cookware store, appliances store… Extremely nice and clean layout, and have many colors you can choose to build a website. This template has 6 pairs colors : red – green, red – black, red – yellow, black – blue, black-brown, black-green. The highlight in the homepage is the slideshow, static blocks. It is useful and auto play with images, title, description, thumbnail images. 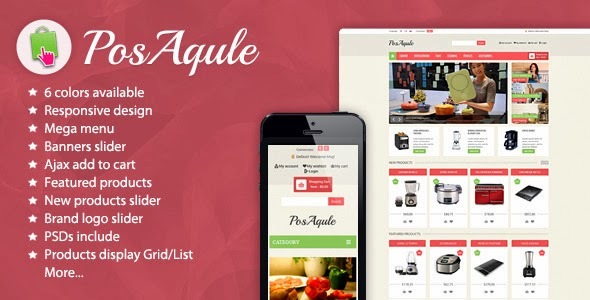 Aqule template uses amazing features supported by Prestashop with great possibilities which help you to build an online store with an ease. Besides, in the homepage show featured products, new products with slider, brand slider. Static blocks with nice images, title and description make home page brighter and neater. Layered navigation ajax extension makes customers buy faster and more convenient. Megamenu customer looks nicer with animate images. Come and enjoy this template! Item Reviewed: Responsive Prestashop Theme for kitchen store or appliances store 9 out of 10 based on 10 ratings. 9 user reviews.